I set out writing this not to debunk the supernatural world of today, or the paranormal investigators in their hard work or studies. In no shape or form do I in anyway intend to discredit anyone or offend those who might stumble across this in the future. In a few short years the web has become so familiar that it is hard to think of life without it. Paranormal Ghost Photos, ghost stories, and strange news is at our fingertips in the blink of an eye. The Haunted web may be worldwide but it is only just getting started. We all want hard truths, plosive facts that life exist after death. That there is an afterlife, a continence not an end. In life things end in a moment, and the fear of not having anything more affects us all. Some people many just want to experience the paranormal at certain points and times in their lives just as a thrill or a new experience. Still others want to know for certain that their religious beliefs are so supported about an afterlife they wish to contact the dead to affirm to them the existence of the other side. Doctrine tells us that the afterlife is there, but many ask is it real. And those that believe in ghosts their for believe in heaven, hell, angels, demons and most certainly the Devil and God. To not believe in a ghost means to not believe in any of the before mentioned, then to say what proof of all this do we have but faith. In all fairness who or what gives a particular person the right to deem something authentic, genuine or real paranormal. A scientist will look to the heavens through a telescope, see a new star. Photograph it then take the photo bring it to everyone and say here is a new star. Also giving their papers of maps and co-ordinates, thus the scientific example of proof. But what if someone goes back and checks and the star is not there? Does this result mean he is wrong? Someone else goes and looks and it's there?So who becomes the judge and has the last qualifying decision? A Skeptic is one who instinctively or habitually doubts, questions, or disagrees with assertions or generally accepted conclusions. Along with that familiarity with browsers and bookmarks goes a little knowledge about the haunted history of so many strange places comes easily. But all in all the search for information, or real proof of what is real still continues. And to many the proof changes everyday. It was a science fiction fantasy come true: Ten years ago this summer, NASA announced the discovery of life on Mars. At a Washington, D.C., news conference, scientists showed magnified pictures of a four-pound Martian meteorite riddled with wormy blobs that looked like bacterial colonies. The researchers explained how they had pried numerous clues from the rock, all strongly supporting their contention that microscopic creatures once occupied its nooks and crannies. Ten years later, the results have not been verified. Skeptics have found non-biological explanations for every piece of evidence that was presented on Aug. 6, 1996. And though they still vigorously defend their claim, the NASA scientists who advanced it now stand alone in their belief. This is just an objective look at what is proof of the paranormal. My honest soul purpose and hopes here was to explain and not critique the science that I am to a part of. I am a true believer as we all are of ghosts and the afterlife but as I am who I am, I seek proof everyday. All too often, even I question what goes bump in the night! "James Randi's "$1 million challenge" Most people have heard of the challenge by former stage magician James Randi, offering $1 million to anyone who can demonstrate psychic powers. Randi's $1M challenge was unveiled on 1st April 1996. You can read its terms in full at the web site of the James Randi Educational Foundation (JREF) the organization administering the challenge. Some say who have met Randi Personally that it is not that he does not believe in the paranormal it is just his search for proof of what should be a common reality, that it needs hard scientific undeniable facts. Randi appeared as "The Amazing Randi" on a television show entitled Wonderama from 1967 to 1972. In the February 2, 1974 issue of Abracadabra (a British conjuring magazine) Randi defined the magic community saying, "I know of no calling which depends so much upon mutual trust and faith as does ours." Randi has worked as a professional stage magician and escapologist since 1946. In 1955, he broke Houdini's record for survival in a sealed coffin (1 hour, 33 minutes) by 11 minutes. In his early career, Randi was part of numerous stunts involving his escape from jail cells and safes. During Alice Cooper's 1974 tour, Randi performed as the dentist and executioner on stage. He also designed and built several of the stage props, including the guillotine. An incident where the Royal Canadian Mounted Police searched the band's lockers during a performance has been cited by Randi as leading him to apply for American citizenship. I happened to meet Mr. Randi when he toured with Alice Cooper group in the early 1970's. I honestly liked him and spoke to him at the time to his beliefs of the paranormal. His words to me were. "If you experienced then what makes it not real?" Proof Positive! "Applying Science to the Paranormal." Many today liken James Randi as the modern Houdini of the 21st century, debunking the fake spiritualist, and the phony claims of the current mediums and paramormalist that jam the airwaves and internet. James Randi interest in debunking the paranormal started when he was in his early teens. He has also been credited with exposing Reverend Peter Popoff's fraudulent faith healing schemes in 1987. Randi is author of Conjuring (1991), a biographical history of noted magicians. The book is subtitled: Being a Definitive History of the Venerable Arts of Sorcery, Prestidigitation, Wizardry, Deception, & Chicanery and of the Mountebanks & Scoundrels Who have Perpetrated these Subterfuges on a Bewildered Public, in short, MAGIC!. I, James Randi, through the JREF, will pay US$1,000,000 to any person who can demonstrate any psychic, supernatural or paranormal ability under satisfactory observing conditions. Such demonstration must take place under these rules and limitations. This is the primary and most important of these rules: Applicant must state clearly in advance, and applicant and JREF will agree upon, what powers or abilities will be demonstrated, the limits of the proposed demonstration (so far as time, location and other variables are concerned) and what will constitute both a positive and a negative result. NOTE: Prior to preliminary testing, an applicant may be required to provide three notarized affidavits from persons who have witnessed the claimed paranormal phenomenon. These witnesses must be educated working professionals such as doctors, nurses, therapists, researchers, psychologists, lawyers, educators etc. This last requirement may be either waived or required at the sole discretion of the JREF. This is the primary and most important of these rules. Only an actual performance of the stated nature and scope, within the agreed-upon limits, will be accepted. Anecdotal accounts of previous events are not accepted or considered. We consult competent statisticians when an evaluation of the results, or experiment design, is required. We have no interest in theories or explanations of how the claimed powers might work; if you provide us with such material, it will be ignored and discarded. Applicant agrees that all data (photographic, recorded, written, etc.) gathered as a result of the testing may be used freely by the JREF. No part of the testing procedure may be changed in any way without the agreement of all parties concerned. JR may be present at some preliminary or formal tests, but will not interact with the materials used. In all cases, applicant will be required to perform the preliminary test either before an appointed representative, if distance and time dictate that need, or in a location where a member of the JREF staff can attend. This preliminary test is to determine if the applicant is likely to perform as promised during a formal test. To date, no applicant has passed the preliminary test, and this has eliminated the need for formal testing in those cases. There is no limit on the number of times an applicant may re-apply, but re-application can take place only after 12 months have elapsed since the preliminary test. All of the applicant's expenses such as transportation, accommodation, materials, assistants, and/or all other costs for any persons or procedures incurred in pursuit of the reward, are the sole responsibility of the applicant. Neither the JREF nor JR will bear any of the costs. When entering into this challenge, the applicant surrenders any and all rights to legal action against Mr. Randi, against any persons peripherally involved, and against the James Randi Educational Foundation, as far as this may be done by established statutes. This applies to injury, accident, or any other damage of a physical or emotional nature, and/or financial or professional loss, or damage of any kind. However, this rule in no way affects the awarding of the prize. At the formal test, in advance, an independent person will be placed in charge of a personal check from James Randi for US$10,000. In the event that the claimant is successful under the agreed terms and conditions, that check shall be immediately surrendered to the claimant, and within ten days the James Randi Educational Foundation will pay to the claimant the remainder of the reward, for a total of US$1,000,000. One million dollars in negotiable bonds is held by an investment firm in New York, in the "James Randi Educational Foundation Prize Account" as surety for the prize funds. Validation of this account and its current status may be obtained by contacting the Foundation by telephone, fax, or e-mail. This offer is made by James Randi through the JREF, on the behalf of no other person, agency or organization. Although others may become involved in the examination of claims and may add their reward money to the total in certain circumstances, James Randi (via the JREF) will carry out the implementation and management of the challenge. JREF will not entertain any demand that the prize money be deposited in escrow, displayed in cash, or otherwise produced in advance of the test being performed. JREF will not cater to such vanities. This offer is open to any and all persons, in any part of the world, regardless of gender, race, educational background, etc., and will continue in effect until the prize is awarded. Upon the death of James Randi, the administration of the prize will pass into other hands, and it is intended that it continue in force. EVERY APPLICANT MUST AGREE UPON WHAT WILL CONSTITUTE A CONCLUSION THAT, ON THE OCCASION OF THE FORMAL TEST, HE OR SHE DID OR DID NOT DEMONSTRATE THE CLAIMED ABILITY OR POWER. This form must be accompanied by a brief, two-paragraph description of what will constitute the demonstration. NOTE: No special rules, exceptions, conditions, standards, or favors will be granted without the mutual agreement of those concerned — in advance. Any applicant who refuses to agree to meet the rules as outlined here, will not be considered to have ever been an applicant. Only complete agreement with these rules will allow the "applicant" to become a "claimant." Applicant, by signing, notarizing and submitting this form, signifies agreement with all of the above rules. Be advised that you should conduct proper and secure tests of your own to determine whether your abilities or claims are actually valid. This application will be signed by JR and returned to you by mail after a test protocol has been mutually agreed upon, and a test date and location have been determined. IMPORTANT: Only claims that can be verified by evidence under proper observing conditions will be accepted. JREF will NOT accept claims of the existence of deities or demons/angels, the validity of exorcism, religious claims, cloudbusting, causing the Sun to rise or the stars to move, etc. JREF will also NOT test claims that are likely to cause injury of any sort, such as those involving the withholding of air, food or water, or the use of illicit materials, drugs, or dangerous devices. Randi entered the international spotlight in 1972 when he challenged the public claims of Uri Geller. Randi accused Geller of being nothing more than a charlatan using standard "magic" tricks to accomplish his allegedly paranormal feats, and he backed up his claims in the book The Magic of Uri Geller. The original edition contained a number of factual errors, including the claim that Geller had been convicted of fraud in a criminal trial, and misstatements about whether there was a clear view of the window in the room where Geller did his work, a place Randi admitted he had never been. Randi's critics have seized on these statements, claiming that they are deliberate and that they undermine Randi's credibility. Several publications that reprinted Randi's allegations were successfully sued by Geller, or they settled with him. Randi has since produced a new edition of the book with extensive corrections and revisions, and renamed it The Truth About Uri Geller. Randi was a founding fellow and prominent member of CSICOP, the Committee for Scientific Investigation of Claims of the Paranormal. Randi later resigned from CSICOP during the period when Uri Geller was filing numerous civil suits against him. CSICOP's leadership, wanting to avoid becoming a target of Geller's litigation, requested that Randi refrain from commenting on Geller. Randi refused and resigned. He still maintains a respectful relationship with the group and frequently writes articles for its magazine. Randi has gone on to write several books analyzing and criticizing beliefs and claims regarding the paranormal. He has also been instrumental in exposing frauds and charlatans who exploit this field for personal gain. In one example, his Project Alpha hoax, Randi revealed that he had been able to orchestrate a years-long compromise of a privately-funded psychic research experiment. The hoax became a scandal and demonstrated the shortcomings of many paranormal research projects at the university level. Some said that the hoax was unethical, while others claimed his actions were a legitimate exercise in debunking poor research techniques. 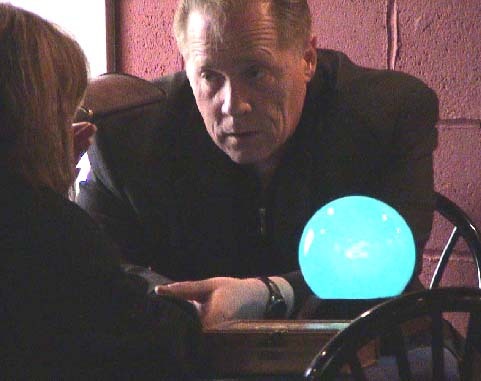 Later, his "Carlos" hoax, in which he hired performance artist Josè Louis Alvarez to act as a psychic, pointed out the gullibility of New Age believers. "Carlos" performances began in Australia in 1988 as a story for an Australian newsmagazine show, and continued to take place for many years even after the hoax was voluntarily exposed. He has also been handing out his own annual "Pigasus Awards" (originally known as "Uri Awards") to mock parapsychological frauds and credulous acceptance or promotion of pseudoscience. Do you believe in the paranormal?... Are you a real Skeptic? Many of the real ghost hunters and paranormal investigators are 100% skeptics, or should be. When it is to easy to believe then what's the point of investigation. To hunt for the truth behind an incident of the other world kind then we need to approach each case with the prove it to me attitude, and just as James Randi we all need to set our bar high and challenge what others accept to easily. Haunted America Tours as does so many other web sites puts forward what people believe to be the real haunted thing. It's not that this site or any ask you to blindly believe their ghost photos or ghost stories to be real truth , but to put it out their for someone to investigate and question. Inclusion of photos or EVP recordings here does not necessarily constitute endorsement of them by Haunted America Tours or any other web site as genuine proof of paranormal activity. There are three kinds of people in the world: Those who believe in an ghost, those who don't, and those who make the sign of the cross when they go past the graveyard. Many now a days investigate the paranormal using night vision surveillance, conventional as well as digital video and photography, various recording devices to try to verify the existence of ghosts and paranormal phenomena. Some web sites boast "The largest collection of paranormal material on the internet!" Or, "The Real Haunted Deal." From Scifi's Ghost Hunters ... TAPS, to home grown bible belt haunted ghost groups, and the full gambit of haunted walking tours and weekend stays in haunted hotels, or a nice visit to a reported real haunted cemetery, haunting's and haunted places do exist in all the common places, cities around the United States and the world. Lingering spirits seem to turn up more often at restaurants, hotels and bed and breakfasts, business types that are able to capitalize on ghost sightings. Every Monday night millions of Americans tune into Medium, NBC’s new hit drama featuring Allison DuBois, an ordinary woman who helps police solve baffling crimes through her ability to communicate with the dead. The internet today plays host to more haunted web sites, and ghost hunting groups and organizations then one could imagine. To me evidence is and has always been something tangible and scientific, something that can be measured and explained. On January 16, 2004, EYEbeam Media Inc. producers of the hit series Creepy Canada (CTV Travel, OLN, Discovery Channel, CTV), was or is offering a $50,000.00 reward to the individual(s) who submit the most compelling story (as per our Jury's selection) along with indisputable proof of the existence of paranormal activity anywhere in Canada. Toronto, Ontario - EYEbeam Media Inc. producers of the hit series Creepy Canada (CTV Travel, OLN, Discovery Channel, CTV), is offering a $50,000.00 reward to the individual(s) who submit the most compelling story (as per our Jury's selection) along with indisputable proof of the existence of paranormal activity anywhere in Canada. The producers wish to be ultimately clear in that they WANT to award this money, so there are no hidden rules or regulations regarding "Proof". All 'Proof" means is that our jury agrees that what has been examined cannot be otherwise explained. The Producers want to hear from the public at large, as well as the paranormal research community. The submissions are not limited to ghosts, and may include monsters of any kind - lake or mountain, ectoplasm, etcetera. Locations can be anywhere in Canada, and may include private residences. Before submitting, all interested parties should read the PROOF submission form by clicking on this link - PROOF On-Line Submission. With television shows like Scifi's Proof Positive, Ghost Hunters, Medium, Most Haunted, Supernatural, Ghost Whisperers, and psychic detectives, Sylvia Brown, John Edward and several specials. The haunted paranormal field and ghosts are in the spotlight once again. All of this as suggested proof or truths. As individuals there are certain truths we accept each day in our daily lives. Unless your a bonafied ghost hunter or psychic then the reality of the supernatural rarely comes in to play. We all have truths are mine the same as yours? Every one search for answers in all we perceive. A television show does not equal what strange occurrences go on in a real haunted house or in the mind of the person being so unhappily haunted. But for those that strange abnormal paranormal occurrences do not happen to then the burden of proof falls far from them. I my self have had many a strange paranormal happenings occur to me in my life time, from ghosts being encountered of loved ones and strangers, to time shifts, and the spotting of an occasional UFO. But I too must state that when someone comes to me, no matter how much I do trust them or know they do not lie, I still judge their haunted ghost story or paranormal occurrence with a very skeptical eye. I question them repeatedly and ask for all from the emotional to the physical feelings they experienced. I want to believe them I really do, but in fact I too still want proof! Read more Ghost Stories of the unexplained here. See if you can find the Paranormal truth for your self! FIND HALLOWEEN 2007 SAFETY TIPS PLEASE VISIT HERE! Hey Ghost Hunters Get Your Own Custom t-shirts with your Paranormal groups design. Free Quotes. Fast Free Shipping. You choose from name brand blank goods in numerous styles and price ranges.